NASA's Spitzer Space Telescope was launched in 2003 to study the universe in the infrared. It is the last mission of the NASA Great Observatories program, which saw four specialized telescopes (including the Hubble Space Telescope) launched between 1990 and 2003. "Spitzer's highly sensitive instruments allow scientists to peer into cosmic regions that are hidden from optical telescopes, including dusty stellar nurseries, the centers of galaxies, and newly forming planetary systems," NASA wrote on the Spitzer website. "Spitzer's infrared eyes also allows astronomers see cooler objects in space, like failed stars (brown dwarfs), extrasolar planets, giant molecular clouds, and organic molecules that may hold the secret to life on other planets." The telescope is named after Lyman Spitzer Jr., an astrophysicist who made major contributions in the areas of stellar dynamics, plasma physics, thermonuclear fusion and space astronomy, according to a NASA biography. Spitzer was the first person to propose the idea of placing a large telescope in space and was the driving force behind the development of the Hubble Space Telescope. A montage of images taken by NASA's Spitzer Space Telescope over the years. Infrared light is transmitted by any object that has a temperature above zero Kelvin (roughly minus 460 degrees Fahrenheit, or minus 273 degrees Celsius). But our sky filters out many of the wavelengths, prompting astronomers to seek out opportunities to send up space telescopes to catch the rest. The first infrared telescopes flew on brief flights that got above most of the atmosphere (including Lear jets and sounding rockets), according to NASA's Spitzer website. In 1979, NASA proposed a Shuttle Infrared Space Facility (SIRTF) that would fly on the space shuttle. At the time, it was assumed shuttle missions would last 30 days and flights would take place every week (optimistic projections far beyond what the program achieved.) Later, it was also discovered that shuttle vapors would interfere with telescope operations. Meanwhile, NASA, the United Kingdom and the Netherlands collaborated on an infrared telescope called The Infrared Astronomical Satellite (IRAS), which flew for 10 months in 1983 to great success and sparked calls for a follow-up mission. NASA decided to change its SIRTF to a free-flying concept, and changed the name to Space Infrared Telescope Facility (keeping the acronym the same). In 1991, a National Research Council report stated that infrared technology had progressed substantially, to the point where it recommended SIRTF, an airplane-based telescope called SOFIA, and an infrared ground telescope for Mauna Kea, Hawaii. NASA's budget was considerably slashed after this report, leading SIRTF to change from a $2.2 billion observatory to one costing about half a billion dollars. "A significant factor in maintaining the scientific integrity of Spitzer, despite the budget cuts and dramatic redesign, was a series of clever and innovative engineering decisions, including a warm-launch, and a unique choice of orbit," NASA stated. Upon launch on Aug. 25, 2003, the telescope had three instruments: the infrared array camera (IRAC), an infrared spectrograph, and a multiband imaging photometer. The entire instrument package needed to be cooled to minus 459 F (minus 268 C) to function properly. 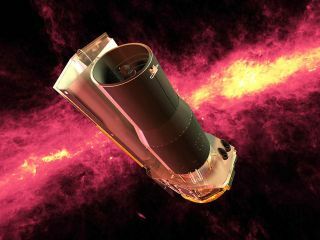 Spitzer officially received its new name four months after launch, when the telescope was shown to be working properly. The mission was supposed to last 2.5 years with the "cryogenic" (cold) instruments functioning; the cryogen was depleted after 5.5 years in May 2009. Spitzer still can use two channels of the IRAC even while warm, so operations with that one instrument are ongoing. Spitzer is expected to last until "late in this decade," the website states. Spitzer was not designed to look at extrasolar planets, but it turns out that the telescope has been quite useful in letting us look at star systems besides our own. "The telescope was the first to detect light coming from a planet outside our solar system, a feat not in the mission's original design," NASA wrote in a 2013 press release. "With Spitzer's ongoing studies of these exotic worlds, astronomers have been able to probe their composition, dynamics and more, revolutionizing the study of exoplanet atmospheres." This even includes mapping climate patterns on a smaller super-Earth, a discovery the Spitzer team announced in 2016. What's more, Spitzer confirmed a very close rocky planet — only 21 light-years away — in 2015, again showing the range of capabilities the telescope is capable of. The telescope, NASA said in 2013, also provided some secrets of the universe at large: "A complete census of forming stars in nearby clouds; making a new and improved map of the Milky Way's spiral-arm structure; and, with NASA's Hubble Space Telescope, discovering that the most distant galaxies known are more massive and mature than expected." Besides looking at things far away from us, Spitzer assisted with a mission far closer to home. The telescope observed a comet called Tempel 1, which the NASA Deep Impact mission hit in 2005. After the hit, the comet revealed a surprise ejection of clay, carbonates and crystallized silicates, NASA stated. "These chemicals are thought have formed in warm environments, possibly near the sun, but away from the chilly outer neighborhood of comets," NASA wrote in a 2005 press release. "How did these compounds get inside comets? One possibility is that materials in our early solar system mixed together before being sorted out into individual bodies." Even observations of well-known solar system bodies brought surprises. In 2009, Spitzer found an enormous ring around Saturn that had remained hidden before then. The material ranges from 3.7 million to 7.4 million miles (6 million to 12 million kilometers) away from the planet, and likely comes from the planet Phoebe, NASA wrote at the time.